A documentary television crew interviews musicians preparing for a rehearsal in a rundown church that doubles as a makeshift auditorium. Durning the interviews the musicians interrupt one another and show outright contempt. Each musician believes their instrument is the most vital to the success of the performance and calls the other performers talent and integrity into question. The conductor barks orders with an affected German accent to drive home his authoritarian role in the orchestra. He has conflicts with both the musicians and the labor reps who are overseeing the proceedings. The tension is immediate and eventual spirals into chaos and revolution. Orchestra Rehearsal is overtly political and satirical in its execution. Connections to our current political climate are in fact easy to make. This is one of Fellini's funniest and most thoroughly entertaining efforts. 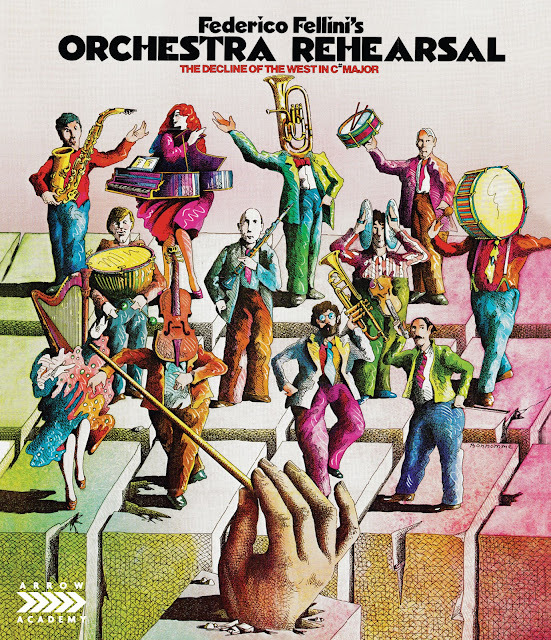 Rich imagery and expressive style fill every frame of Orchestra Rehearsal and marks the final collaboration between Fellini and legendary composer Nino Rota who provides one of a beautiful theme in the film's conclusion. Orchestra Rehearsal is available from MVD here.